"Newbery Honor winner Preus infuses the story with the good-natured humor of a largely unified, peace-loving people trying to keep their sanity in a world gone awry. Based on a true story, the narrative is woven with lively enough daily historical detail to inspire older middle-grade readers to want to learn more about the Resistance movement and imitate Espen’s adventures." "This engrossing offering sheds light on the Norwegians’ courage during World War II. 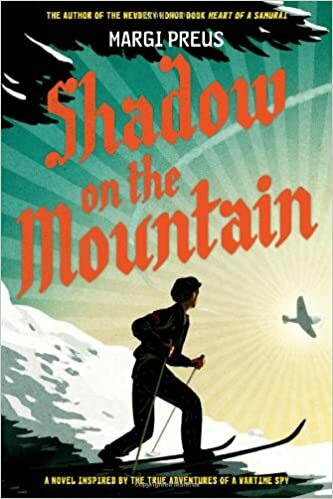 Preus masterfully weds a story of friendship with the complications faced by 14-year-old Espen and his friends as Nazi restrictions and atrocities become part of their everyday lives...This is at once a spy thriller, a coming-of-age story, and a chronicle of escalating bravery. Multidimensional characters fill this gripping tale that keeps readers riveted to the end." "A closely researched historical novel... relates this wartime tale with intelligence and humor...Ms. Preus deftly uses together historical fact (Espen is based on a real-life spy) and elements of Norwegian culture to conjure a time and place not so terribly long ago." "Margi Preus, who won a Newbery honor for Heart of a Samurai, returns with another riveting work of historical fiction... This fine novel, which includes an author’s note, a timeline, a bibliography and even a recipe for invisible ink, is based on extensive research... The result is an authentic coming-of-age story, perfect for readers fascinated by the diary of Anne Frank or Lois Lowry’s classic, Number the Stars." "The final chapters, which chronicle Espen’s dramatic escape to Sweden—days and nights of mountain skiing, Nazis in hot pursuit—take the book into adventure-thriller territory without losing the humanity that characterizes Preus’s account." "Preus makes crystal clear the life imperiling risks that Espen undertakes and the danger to his family."